Last night the predicted cold northerly air mass arrived, colliding with the muggy mild air coming from the south. This resulted in a huge thunderstorm and roads awash with flood water. We awoke to a cooler fresher day, temperatures had dropped ten degrees and Autumn had arrived. Shorts to a thermos in 12 hours - it can only happen in England! 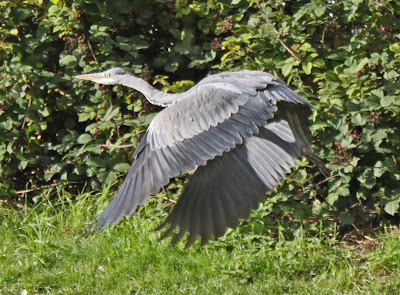 Most autumns I take a solo trip along the Shroppie and just sometimes I invite someone else along - an oxymoron I know! This year I invited mother Ahab, otherwise known as Matilda and figured a trip to Market Drayton would be just the ticket. For each trip I try to plan something different and this year it was a decision to get off the boat and explore some of the villages away from the cut. 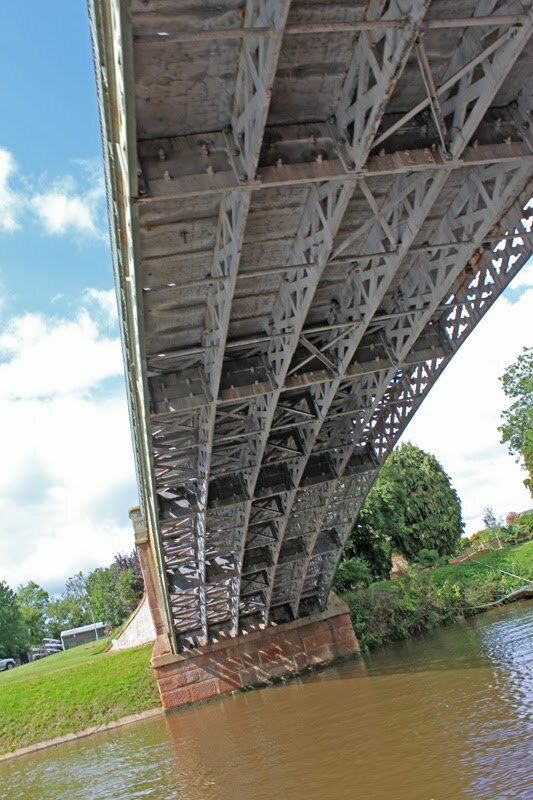 The plan is to visit Brewood, Gnosall Village (not Gnosall Heath) and finally Market Drayton - we will see how we get on. The cold northerly wind was bitter - struggling into double figures and I found myself wrapped up in four layers, a waterproof and gloves and still my fingers went numb. It was real winter boating but the bonus was to travel along behind a chimney spewing woodsmoke, a scent I always associate with the canals. The Staffs and Worcester was bustling with boats but after we passed Napton Narrowboats at Autherley the traffic died away and we has the Shroppie pretty much to ourselves all the way to Gnosall. We did pause at Brewood, but our exploration justifies it's own post so more of that tomorrow. Belle sometimes makes strange requests of me, and today she asked me to take a photograph of the kettle on Wand'ring Bark. 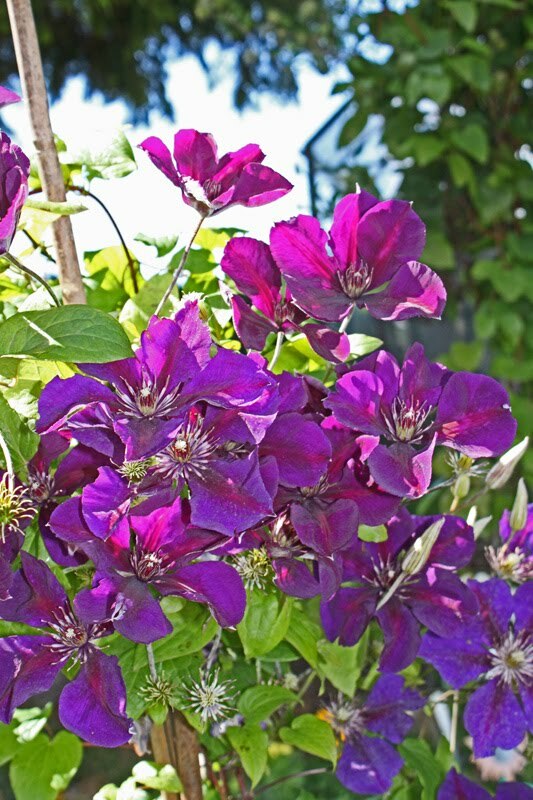 An odd subject I thought, but not an unduly onerous task so I agreed. I was on WB to do some fettling before this weekend's cruise with Matilda, including some work on the stove window. This came off worst on a clash with an enthusiastically wielded handle by Belle whilst in Gloucester. I took the opportunity to change the glass pane and also to replace the rope seals round the door and generally make adjustments to ensure it remains an air tight unit. So, I cleaned up the kettle, took it to the bows and duly took the photo as requested. This kettle came with the boat, and Belle was very taken with it. Perverse though it seems, the kettle played a disproportionate part in her decision to buy the boat. But it seems that Belle wasn't alone in her kettle fetish. 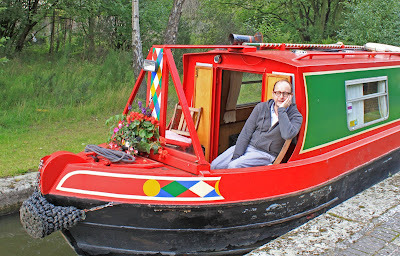 On our return voyage, bringing WB (or Piccolo as she was then) back to Gailey we chanced upon her previous owners. It seems that they had been having trouble finding a replacement kettle and were lamenting leaving the old one on the boat. Without actually saying so, they were asking if they could have it back, please. Given Belle's enthusiasm for the shiny blue kettle I knew she would not be pleased if I gave it away so hung onto it. 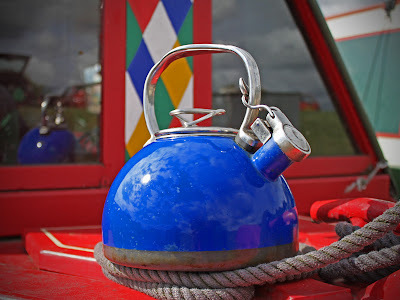 If I am being completely honest I have never been sure if we bought a boat with a kettle thrown in, or a very expensive kettle with a boat for free. 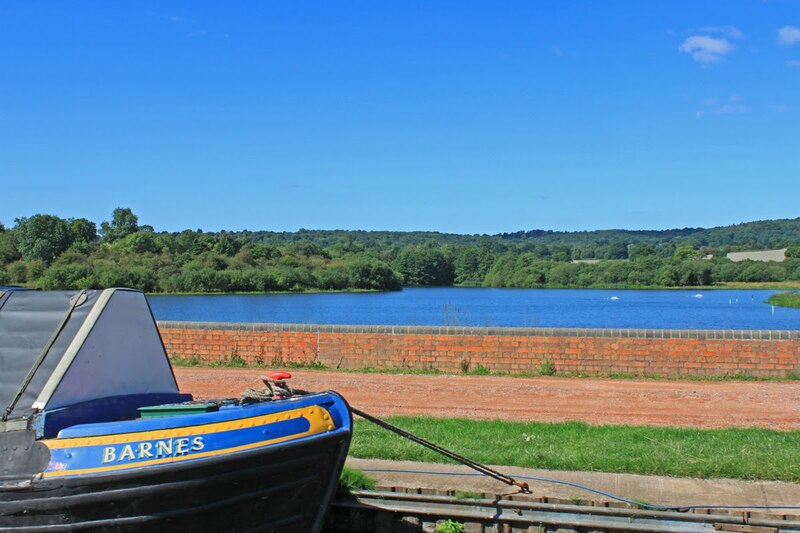 I know the bill of sale from Whilton Marina refers to a boat but I am not so sure that this is really true! So, next time you see us out and about stop for a cup of tea, all heated up in a much loved and highly sought after kettle. 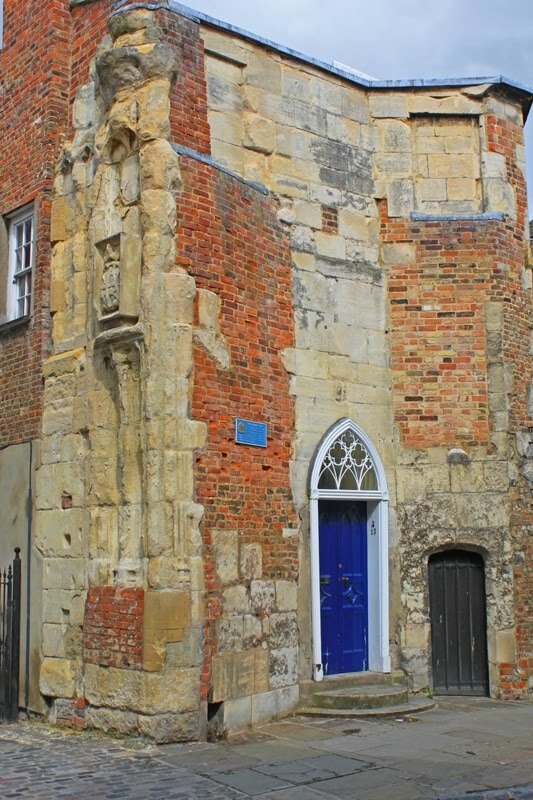 I'm amazed that I have never featured this local landmark before. 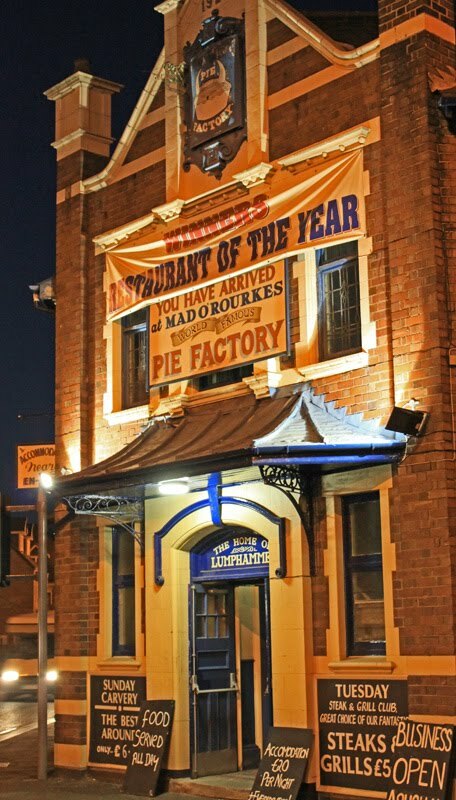 Many of our trips conclude with a night at the Black Country Museum and on most occasions that involves a walk into Tipton to pay homage to Mad O'Rourkes pie factory - a tongue in cheek "traditional" black country boozer. 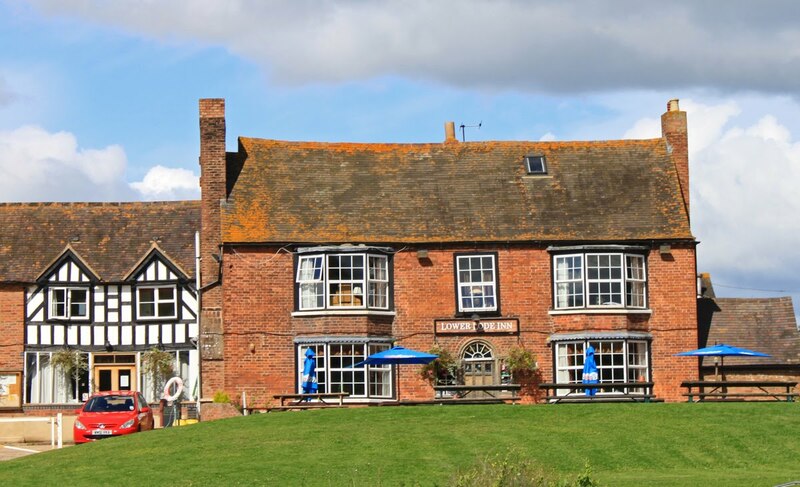 I am not going to go into the pub's history - if you want that there is plenty elsewhere on the internet. 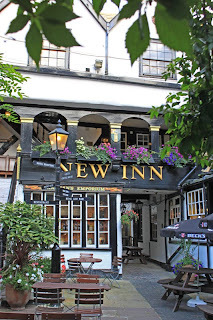 This post is about the pub as an eating destination. It says a lot that we return to it each time we stop in Tipton. The food is good, the beer is excellent and the atmosphere is a bit surreal. 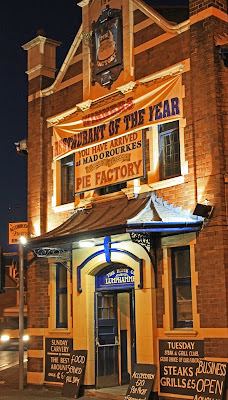 The key question is "Why the Pie factory?". 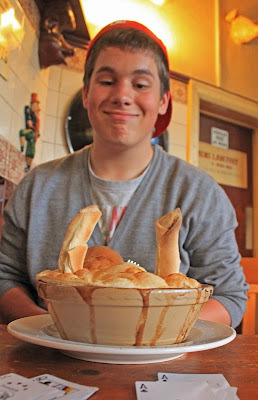 The place is famed for it's signature 4lb Desperate Dan Cow Pie - a huge culinary monstrosity into which the entire meal is packed beneath two pastry horns. It take a big appetite to finish one and, perhaps to my shame, I have never attempted the feat myself. Jeff, on the other hand, has seen some of my boaty friends demolish one and was determined to achieve this calorific Everest himself. He struggled through the meaty foothills, up via the treacherous vegetable stage and then on up the thick crust to reach the summit with a glint in his eye and a pain in his belly. Perhaps what is even more amazing is that he managed to down a chocolate pudding at the end. Belle and myself have more sense than to indulge in mad pie eating contests so settled for more traditional fare, such a mixed grill served on a shovel! All this food needs to be eased down with some lubrication, and at Mad O'Rourkes Lumphammer is the recommended tipple. The inside of the pub is something like Disney meets the Black Country. 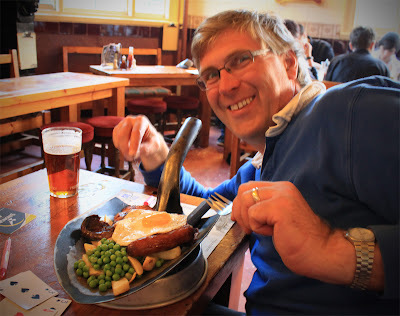 All the essential ingredients of a spit and sawdust pub are there, but exaggerated. It may not be authentic but it's certainly fun. Whilst waiting for our food and finally concluded the epic six handed rummy competition which Belle won by a whisker, I came second and Jeff a close third. This all goes to show that in spite of it appearing to be a game of great skill it is 95% luck. Here's a book you are unlikely to find on the bookshelves. Belle was browsing Barter Books in Northumberland and she scanned the waterways section in search of the obscure and unusual. 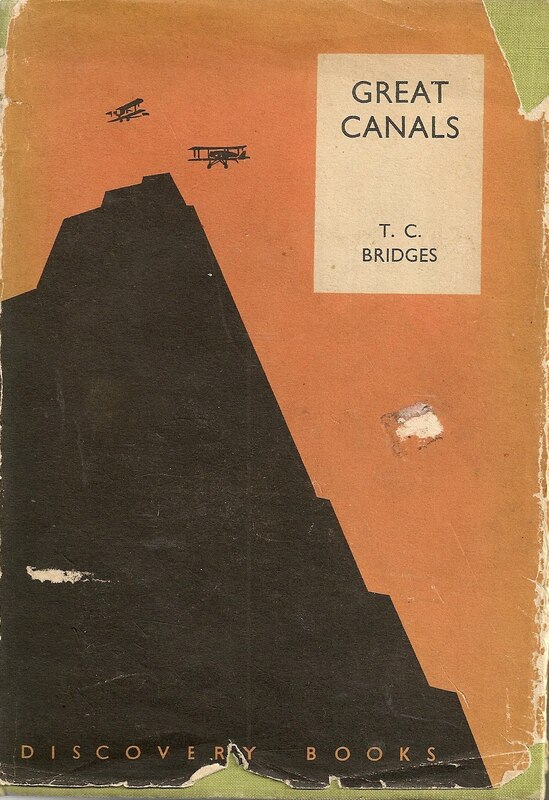 She found a number of books she thought I would like, but in particular she alighted on "Great Canals" by TC Bridges. This was a first (and very likely last) edition published in 1936 with its dust jacket proclaiming "An absorbing account of canals home and abroad - the building and working of the Suez, Panama and Kiel canals, and the network across Britain. A book of unusual interest." The back goes on to explain that this Discovery Series are "Entirely new books which discover the world to young readers, opening fresh vistas of knowledge and adventure. 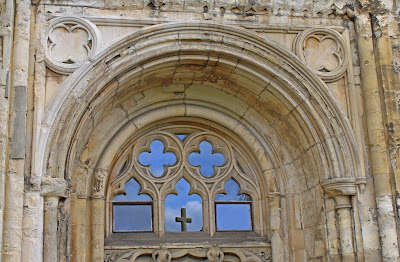 Lucid, fascinating, modern in the best sense of the word". What we have here is a contemporary view of canal transport written just before the second world war, 22 years after the opening of Panama. Whilst the book contains interesting accounts of major ship canals abroad, it also covers the Nicaragua Canal, an alternate Atlantic / Pacific route which was started but never finished. It also looks at the plans to build a true ship canal across Scotland either via the Great Glen or as a substitute for the small Forth and Clyde. Historic curios I have never heard of before. 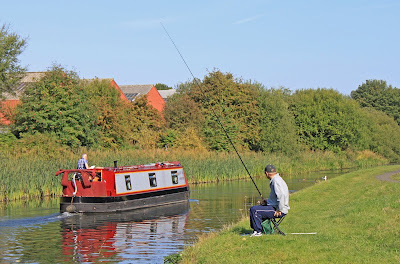 "The Ship Canal is always busy. Between four and five thousand vessels use it yearly, with a combined burden of more than six million tons. The trade to the port of Manchester is valued at about a hundred million sterling a year... making Manchester the fourth port in the UK." Some contrast to the skeleton we see today! Reading history from a pre war perspective is an interesting experience. ISBN - They didn't do ISBN numbers back in the 1930's! 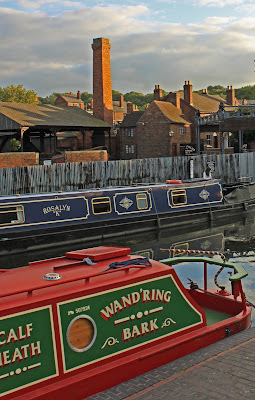 No matter how many times we pass this way I still love the return from the Black Country Museum. It has a bit of everything: urban canals, a tunnel, locks, a junction or four and finally some lovely countryside as we approach base. 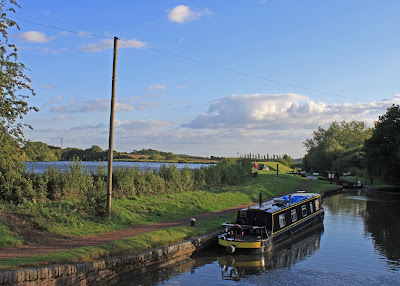 As luck would have it, the weather was the best of the trip with clear blue skies and temperatures which caused us to stop and change into shorts part way down the Wolverhampton 21. We set no speed records on this journey and were happy to trundle along. A boat was descending the 21 ahead of us to we followed in their wake, refilling each lock before us and as we had the extra crew member, sometimes wandering ahead to set the locks for the first boat. At the foot of the locks we met Jeff, a canal enthusiast who enjoys helping boats up and down the lock flights into Birmingham. When the boat in front told me that there was a "bloke at the lock who has set it for them and seemed to know what he was doing" I suspected I would see a familiar face. Of course, we were just leaving the flight so his assistance was limited to just the one lock - but thanks anyway Jeff. 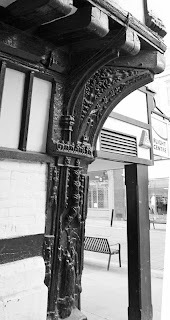 On other point of interest in Wolverhampton. 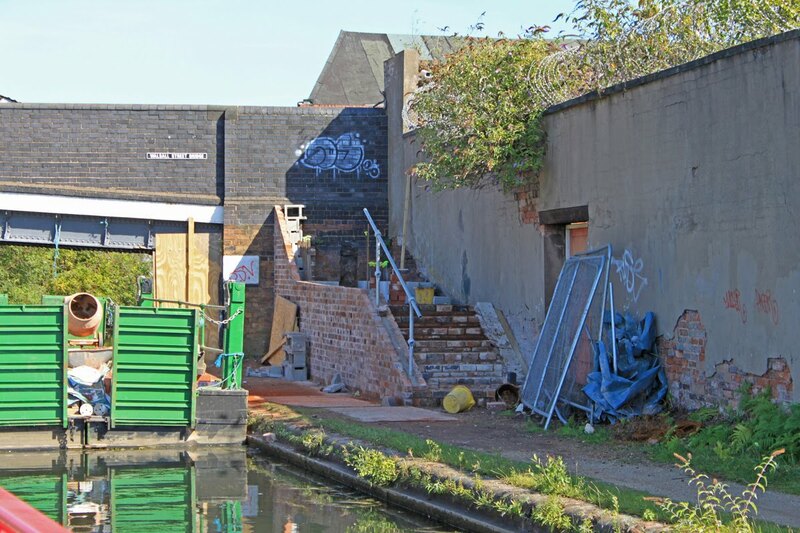 The canal is particularly inaccessible in Wolverhampton due to high bridges with no paths down. 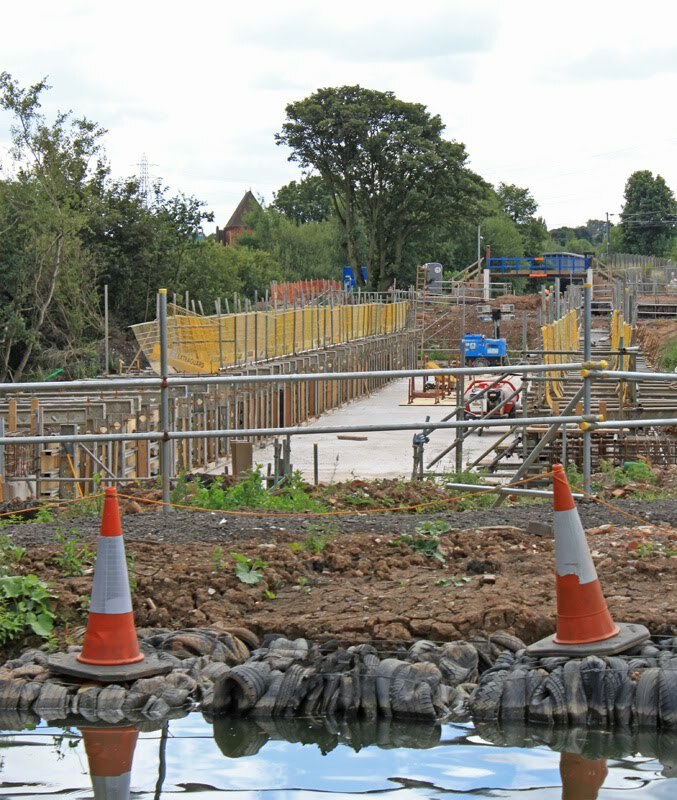 This is being addressed and in two locations ramps and gates are being build to improve access and allow more foot traffic onto the towpath. Sounds like a good idea. The moorings below Tardebigge Top Lock are to be recommended - deep and quiet. 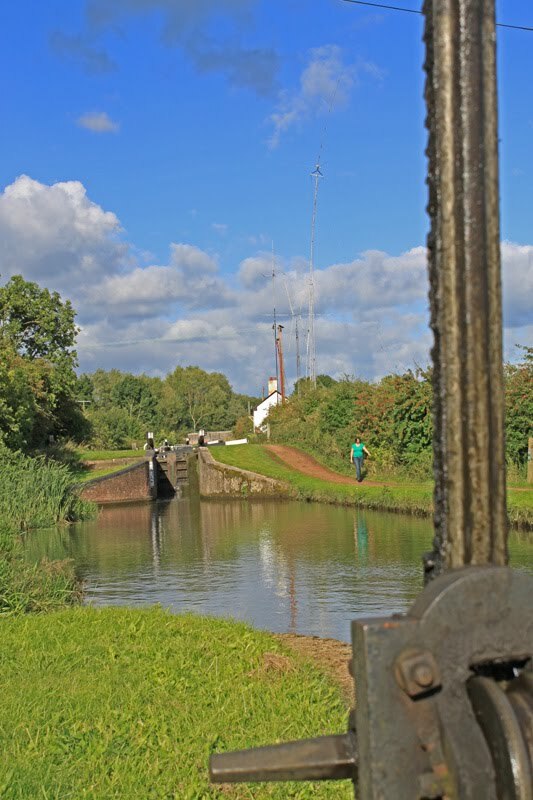 After yesterday's 55 lock marathon we slept late and each waking with differing degrees of stiffness, but today offers respite with just four locks on the 21 mile journey. We (I) set out under wall to wall sunshine, with Jeff and Belle still tucked up in their respective pits so that left the very deep lock at Tardebigge to be negotiated single handed. 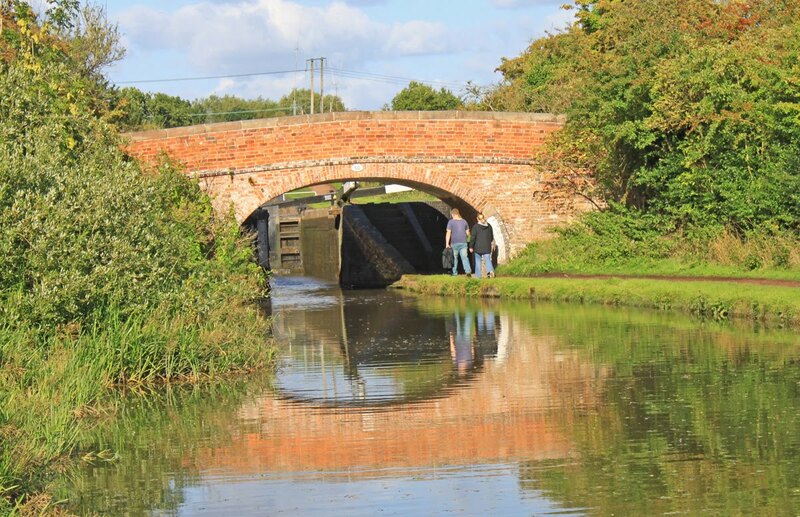 Luckily a Phil and Corin were out walking their dog Jess and watched proceedings with intense curiosity, explaining that they are thinking about a canal holiday next year - whats it like?. I started to explain and then guided them to this blogsite - and lo and behold they left a message to say they will be getting afloat in 2011 for the very first time. Enjoy it, and savour it - there is nothing quite like that first experience of life afloat. It was then up the rural Worcester Birmingham Canal and through it's secession of tunnels, with each one trying to out do the last as we approached the big daddy of them all at Wast Hill. 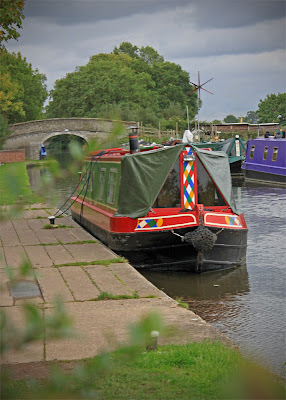 We came up behind a super slow Black Prince Craft who pulled out of the Alvechurch Visitor Moorings, and then crept along at a pace that didn't even raise a ripple from the bows. The progress was such that I was continually disengaging the drive, a situation which became seriously annoying after 30 mins. 'Captain Slow' had no intention of letting us past and seemed determined to force us down to his preferred snails pace, but then fate intervened. He spectacularly misjudged bridge 61, failing to turn as he passed through and drove his boat deep into the trees opposite. I don't pass up golden opportunities like that and was past in a flash, but gained only a stony stare to my cheery "thanks". The sun was out transforming the Bittell Reservoirs to a glittering Mediterranean blue and then on to the 2726 yard Wast Hill, one of four major tunnels in Birmingham, piercing the same range of hills (the others were / are Netherton, Dudley and Lapal). For some reason the tunnel was very misty inside - maybe due to a boater passing with a wood fire going an hour or so before. I was under dressed for the occasion and emerged from the northern portal chilled through and through, to find a couple of boats waiting for me. They were unaware that there is plenty of room to pass inside. We were almost immediately regaled by kids who luckily threw nothing more objectionable then insults - much better than stones. Birmingham city centre was bustling on a sunny bank holiday afternoon, the bars were full and live music was being played outside at Brindley Place. All very cosmopolitan. Robert, one of Belle's thespian friends joined us at Worcester Bar, bringing with him chocolate cake and good cheer. 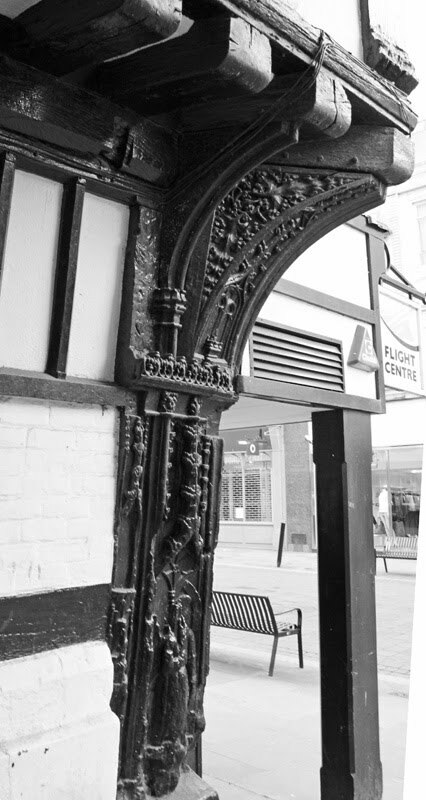 He and Belle nattered away in the bows all the way to Smethwick where he caught a train back. 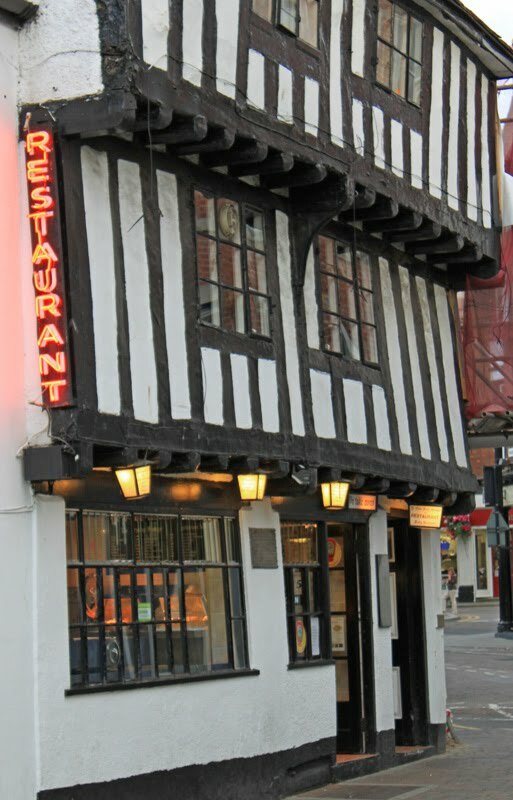 One of our emergency plans had been to get WB to Nick and Victoria's at Symphony Court and leave it there for the week. In the event this offer was unnecessary but we passed through the loop to give then a toot on the off chance that they were in. Not only were they in but they were busy cleaning out nb North Star having been down to Worcester themselves. In the short time we hovered next to them and swapped boating stories a plan was hatched to have a go at the Avon together, a really good idea. The trip from Old Turn Junction to Tipton is unusual in that you have to rise through three locks between the Birmingham level and the higher Wolverhampton Level, but there are four options open to you. 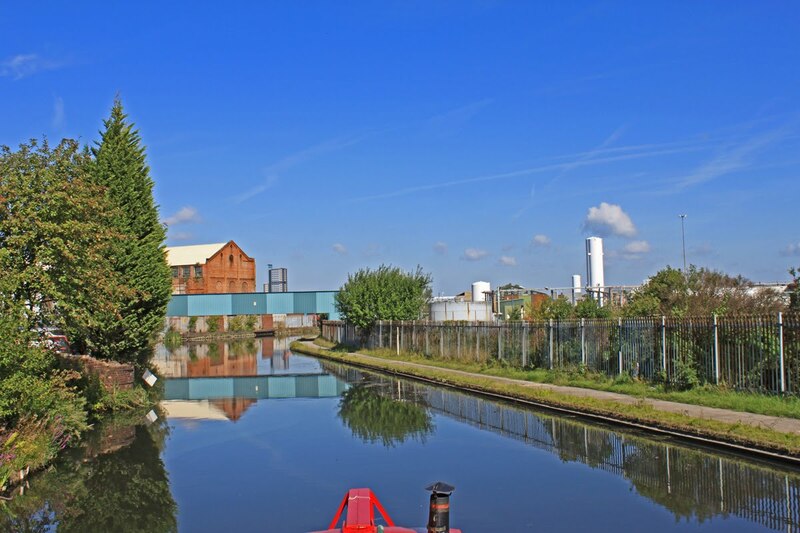 There is the early departure to the Old Main Line at Smethwick, a doubling back at Spon Lane, the staircase at Brades or the Factory Locks at Tipton. This choice is a real dilemma because they all have their attractions, but in the event Robert's departure at Smethwich would be best achieved from the pumping house so a right hand turn at Smethwick Junction was called for. To my mind the winding Old Main Line is infinitely preferable to the remorseless straights of the New Main Line but I always wonder what this costs in terms of time. This trip allowed be to conduct a scientific experiment to test it. 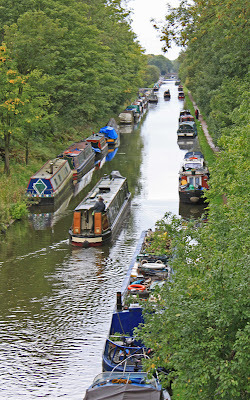 As we passed over Stewart Aqueduct two boats were pushing north beneath us, presumably also making for Tipton. Who would arrive first? 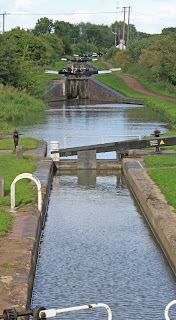 We had the longer journey, but they has three locks to work. End result - we arrived about 15 minutes sooner than those on the main line but my guess is that if we both started at Smethwick Junction they would arrive about 15 mins before us. Not much of a time penalty for the more interesting journey. There is one final incident worthy of mention. 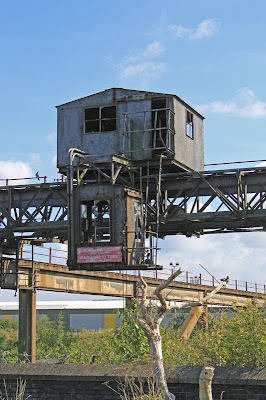 If you are going to get any hassle in the Tipton area it will probably be at the old railway bridge half a mile before the entrance to the Black Country Museum. We have had skirmishes at this spot before so are hyper vigilant for any unusual activity. Today's passing was something of a classic. As we approached a couple of kids were packing up after fishing. Being a suspicious character I watched them closely and saw one twitch as if he had just had a brainwave - ah, Captain take note thought I. 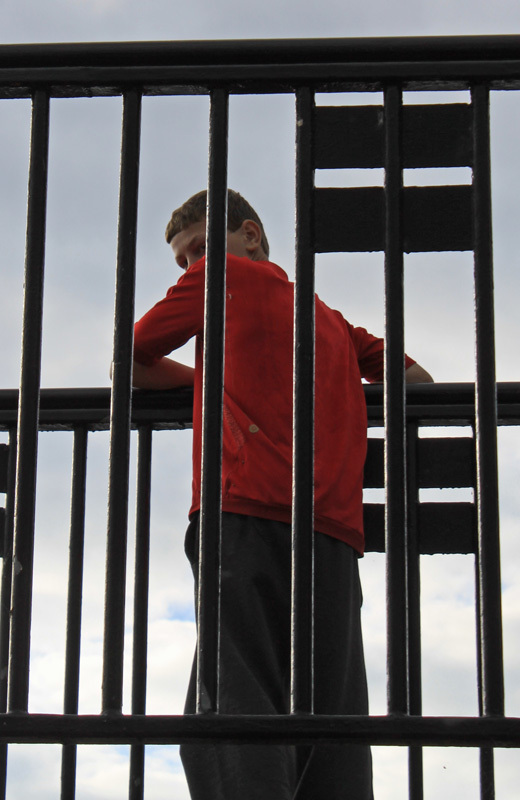 His hand dived into a maggot pot on the ground and he scampered round to position himself on the bridge immediately above us with his snickering mate still standing on the bank. I knew as well as his mate exactly what he was planning - a shower of maggots on my head. I slowed, he turned to see why I was altering speed and found himself staring down the lens of my ever ready camera "click - gotcha". I could sense his mental turmoil - to drop or not to drop, that is the question. 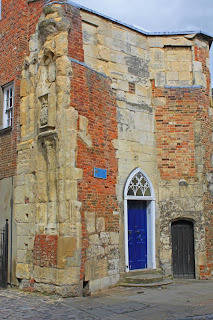 I think that his initial flash of inspiration had done him in because his period of indecision was enough for us to pass beneath his feet leaving him fuming and hurling Anglo Saxon expletives at our quickly dissipating wake. 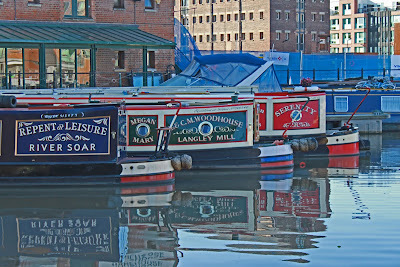 And so into the moorings at the Black Country Museum, my favourite on the BCN. As a last day celebration we decided to pay Mad O'Rourkes a visit, but that justifies a post all of its own. I have had a longstanding liking for the Moody Blues and last night I finally got to see them live in Nottingham. I think it's fair to say that the Moody Blues star was on the wane by the time I chanced upon them in 1979. Their heyday was from 67 to 70 and in an era of punk ,their brand of melodic concept music was so far out of fashion that its a small miracle I discovered them at all. Its' all down to Kate, the secretary at my first office. She whistled "Nights in white satin" endlessly, a tune which settled into my consciousness only to be reactivated when I visited friends a few years later who had all five of the early albums (Threshold of a Dream, Children's Children, Seventh Sojourn etc) on vinyl and were happy to let me tape them. The resulting recordings were played endlessly in my car till the tapes stretched and were eaten up. But the damage was done. The entire early catalogue of the Moody's work was loaded into my cerebral hard drive and there it has stayed, slotted into a dark corner just waiting to be revived. When my brother in law lamented a missed opportunity to see them live a couple of years ago I confessed my appreciation of their work and so a plan was hatched to see them as soon as an opportunity presented itself - and that was last night. So what did I make of it? Can they still deliver the goods? - You bet they can! I bet that these guys never thought that they would still be playing their 1960's classics to adoring sell out audiences 40 years later. The gaps left in the line up are filled with the addition of two guys on drums and keyboards and two girls on keyboards, flute, harmonica, guitar and vocals, and whilst they are credited during the performance, its clear that 'the band' consists on Hayward, Lodge and Edge. The combination of the three stalwarts and the four supplements is electrifying. They put their all into it and carry it of with style. They are still a very tight live band, harnessing modern technology but staying true to the original sound we love so much. The show routine is well established, right down to Edge and the other drummer chucking their drumsticks to each other, but I wasn't expecting too much improvisation. Justin Hayward's silky voice is as good as ever and if you closed your eyes you wouldn't think that he and John Lodge are deep into their 60's. The band projected a series of psychedelic images onto the screen behind them, sometimes including photos of them in all their flower power finery. 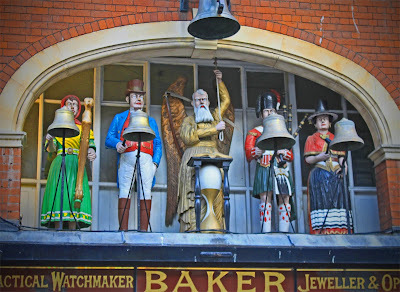 It was hard to believe that the lads peering out of faded images were one and the same as the guys on the stage belting out 'Tuesday' and 'Nights in white satin'. The play list included material from all seven albums and whilst not word perfect, I knew all bar two from the 1990's era. Then there is the audience. Inevitably they (we) were mostly of a certain age and the reflected glare when the stage lights shone on the audience's heads was blinding. That said, they played to a packed house and the audience loved every minute. Maybe the bloke in front of me bowing down in homage was a bit much, but their performance justified the adulation they received. My only negative take away were the harmonies. 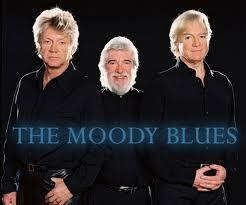 The Moody Blues were famed for their towering harmonies, voice climbing on voice. The reduced line up, taken with advancing age has taken its toll on the scope for the multi layered harmonies. This isn't a criticism really - just an observation. Some musical material ages very badly but not so the Moody's. Their sound was always distinctive and has proved to be timeless. At £30 plus, the tickets are by no means cheap but to experience the magic of the Moody Blues live is priceless. If you are compiling a "100 artists to hear before I die" list it would be a crime to miss out Justin Hayward et al. Belle picked up a remaindered copy of this coffee table book on our journey down the Thames, I think it was "Nauticalia" at Shepperton, a place full of odd boaty nick nacks. Derek's books are full of ying and yang as far as I am concerned. I love his photography but find it hard to engage with his written style so I thanked Belle graciously (not that you can go far wrong for a fiver!) and dipped in with some trepidation. I shouldn't have worried as this is Derek at his best, a book dripping with photos old and new and just a minimal amount of text to explain the views. It's an eclectic mix of photos taken over his 40 years on and around the water, leaping from the 1970's to contemporary images and every year in between. The structure is whimsical too, sometimes focusing on a particular canal, region or theme like aqueducts. This makes it an ideal book to dip in and out of - you know - the sort of book that lives in the loo to fill those odd five minutes when there is nothing better to do. What can I say? I love it - its a great collection of images from across the inland waterways all pulled together with great love and affection. Great value for £5.00 but maybe not the £19.99 quoted on the dust jacket. Yes - that's right, 55 locks. 14 more than my all time record with the hyperactive Mr Truth! With time pressing we kicked around a few ideas about a possible destination for today's travels. 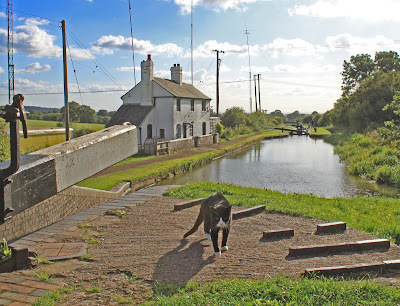 The idea of moving all the way from Diglis Basin to the top of Tardebigge was bandied around for a while, till Belle pointed out that 14 more locks than my all time record was an awful lot - and 20 more than we had ever achieved as a family. We therefore revised our objective and planned to moor at the Queens Head - just below the main flight. With this lesser objective agreed we set off at 9.30am, up the Offerton Locks by Worcester Warriors ground where we spied the stern of Nebulae ascending in front of us. They are a speedy pair with Chris whizzing ahead on his bike, but we held them in our sights all day, managing a quick hello at each lock. The canal narrows alarmingly at Hanbury, with the reeds reducing the navigation channel to single file. I Have heard BW explain this as an attractive feature of the canal but this feature is starting to become a bit over invasive. 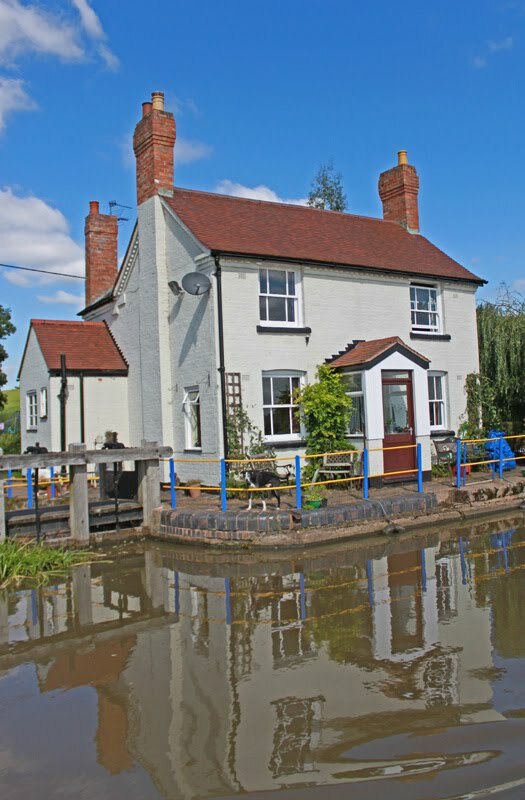 As we passed the Droitwich Junction canal we saw Brian and Diane from nb Harnser - off for a Sunday lunch at the Eagle and Sun. They had been following the blog and didn't appreciate that I was posting it rather retrospectively. 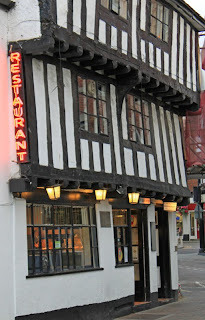 It was therefore something of a surprise to see WB coming up the Worcester Birmingham when the blog suggested that we were still in Brentford! We realised we were making good time and as things were going we would be mooring at 4.30pm, which is a bit early given the time pressure we are under. So, after a short council of war we decided to "go for it". Tardebigge or bust. Its only a mere 30 locks. In the event it settled into a beautiful evening, just perfect for the long run up to the summit. Worcester and the Malverns emerged behind is and with three of us working the locks we arrived at the top lock in a very creditable 2.5 hours - knocking a full 30 minutes off our previous record. 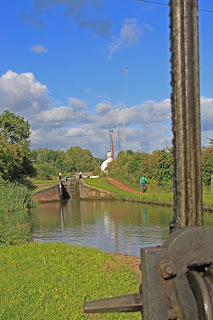 Tardebigge never seems as long as it really is, each lock separated by a short pound making lock wheeling really easy. What's more, the canal snakes around giving a variety of views but never offering an image of a daunting rise like Hatton or Caan Hill. 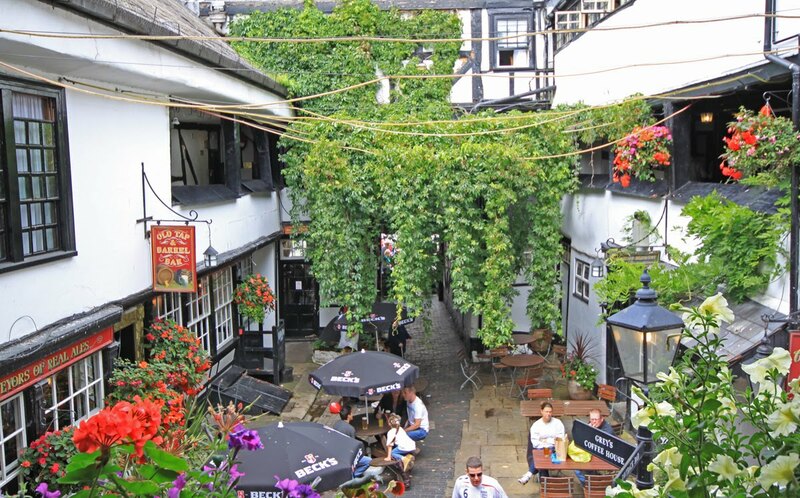 I am not sure we will be doing 55 locks in one day again anytime soon, but if it has to be done the Worcester Birmingham is the place to do it. This is the third book of the Salander / Millennium series, and marks what appears to be the conclusion of the tale. 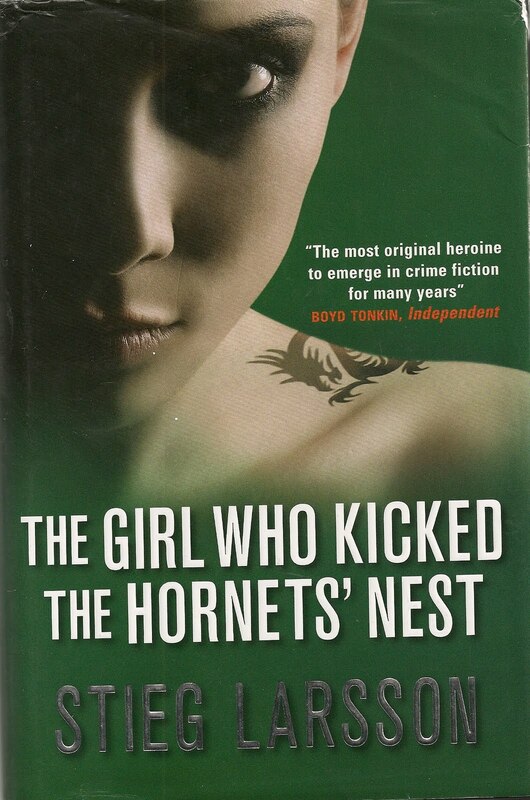 In fact, having read book three, I would say that whilst the first book stands alone, books two and three (The girl who played with fire and The girl that kicked the hornets nest) are in reality a single story and are best read in quick succession. 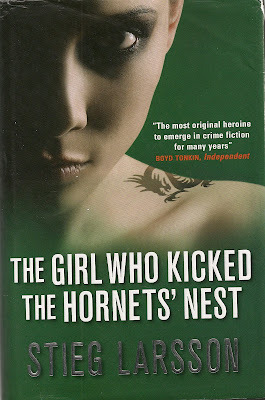 The story picks up with Salander in hospital, with a bullet in her brain and the police guarding her door - and Michael Blonquist doing his best to prove her innocence of the crimes she stands accused of. It turns out that Salander has stumbled into one of Sweden's biggest conspiracies, which goes all the way to the president and includes a Russian defector from the cold war - who must be protected at all costs. It's up to Salander and Blonquist to expose the truth. The plot is detailed and compelling - every bit as good as the previous two books, taking a detailed look at Salanders history which had remained a mystery to this point. Another cracking read. Book two is to be released this summer / autumn, spoken in Sweedish with sub titles but a Hollywood version is also planned with a release planned for December 2011. 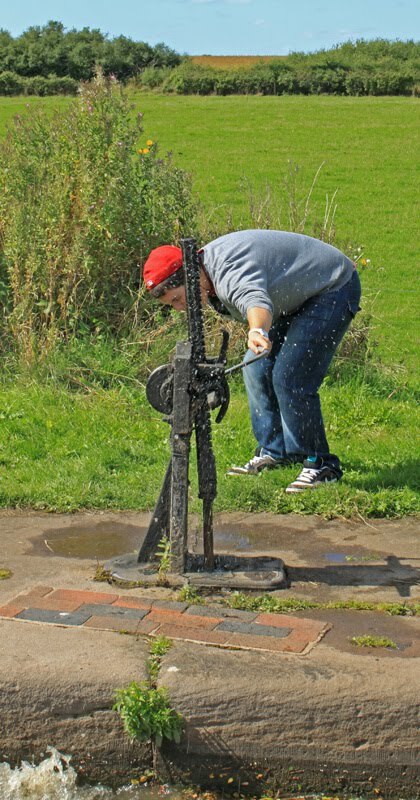 Yesterday's water predictions were not optimistic, so I hauled myself over to the lock keepers office at 8.00am with little expectation in my step. Mentally we were prepared for yet another day in Gloucester, so imagine my surprise to be told that against all the odds, the water level had dropped a metre overnight and was now inside the green zone, by the smallest of margin - and was like that all the way up the river. Put another way - we were hot to trot. 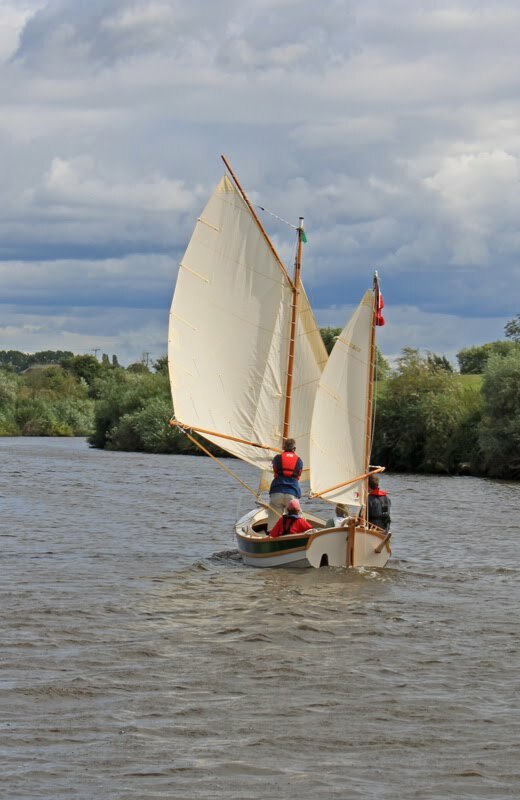 I rushed back to Wand'ring Bark and informed the still horizontal crew that we would be casting off in 15 minutes, and they both had to be up and dressed before we emerged onto the Severn. 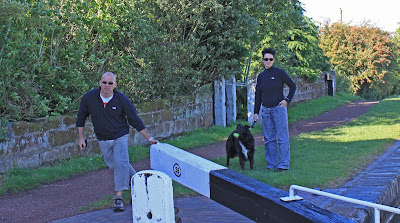 8.20am saw us leave our home for the last four days and enter the Dock lock with another narrowboat. 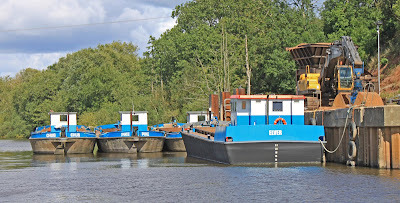 This other boat clearly had a much bigger engine than WB, because she started to pull away even before we were out of the lock. 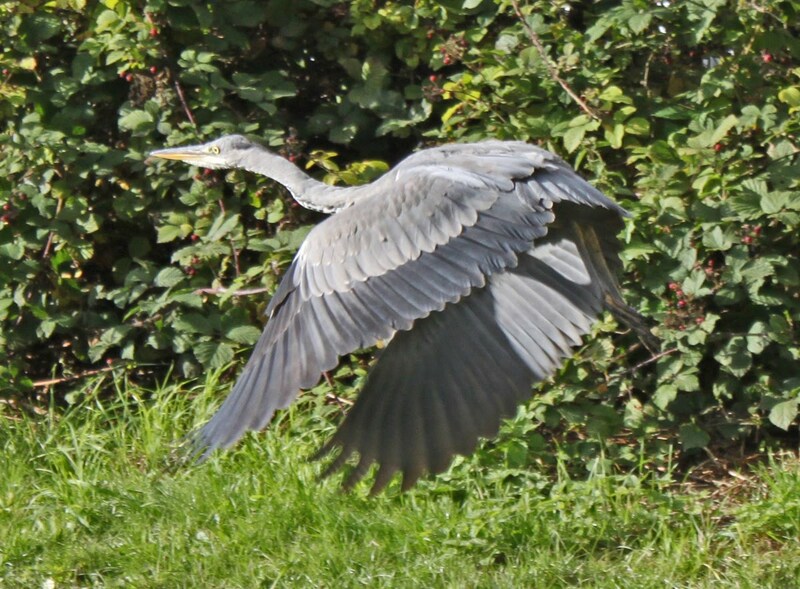 Whilst the Severn had dropped a lot it still had a significant flow on it - about 3.5 mph which robbed WB of much of its forward speed, which is just over 5.00mph flat out of still flat water. This strong current resulted in the two mile passage to Upper Parting taking about an hour, after which the flow slackened and we managed to pick up the pace to a heady 2.5 mph. Half a mile an hour makes a big difference at these low speeds. However, as Jeff and Belle pointed out - 2.5 mph is a good canal speed on some of the shallower waterways - and we were making better progress than on the Trent when we cruised over three metres of fresh. I quake at the memory of it! As you will remember, I was planning to take it easy and avoid straining the shaft, but the flow left me little choice other than open up the throttle and maintain a constant engine speed of over 2000rpm. I periodically took a look at the shaft and engine throbbing beneath me but all appeared OK so I crossed my fingers and ploughed on in a welter of spray. 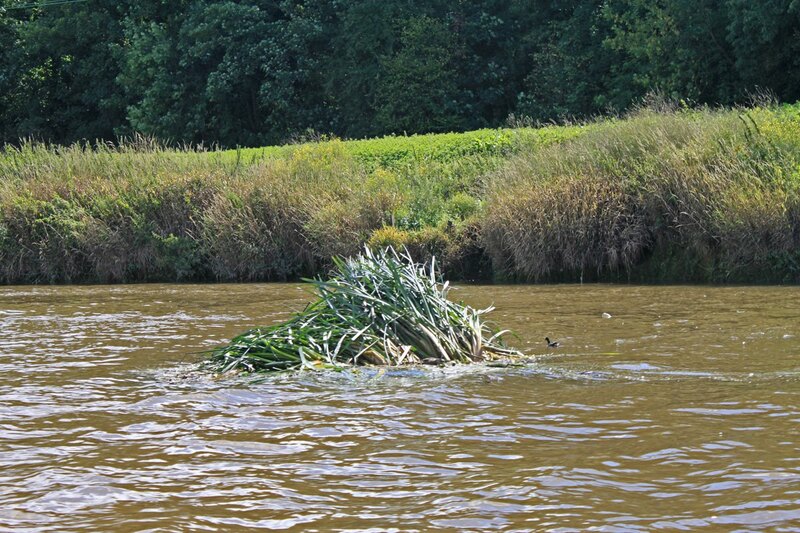 Perhaps the greatest danger on the lower section of the river was the debris being washed down the Avon. 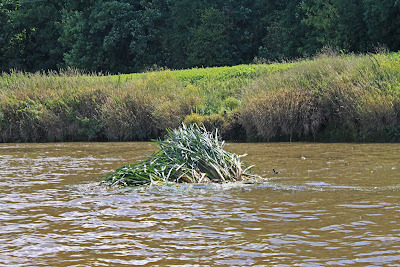 Huge chunks of timber appeared, lying low an the water had to be avoided, as did the big clumps of floating weed. Just above Haw Bridge we came across five firemen in a RIB, coaxing a cow back onto dry land. I don't know how long the unfortunate beast had been in the water but it was soon back on dry land the the firemen were speeding to their recovery point at Apperley. 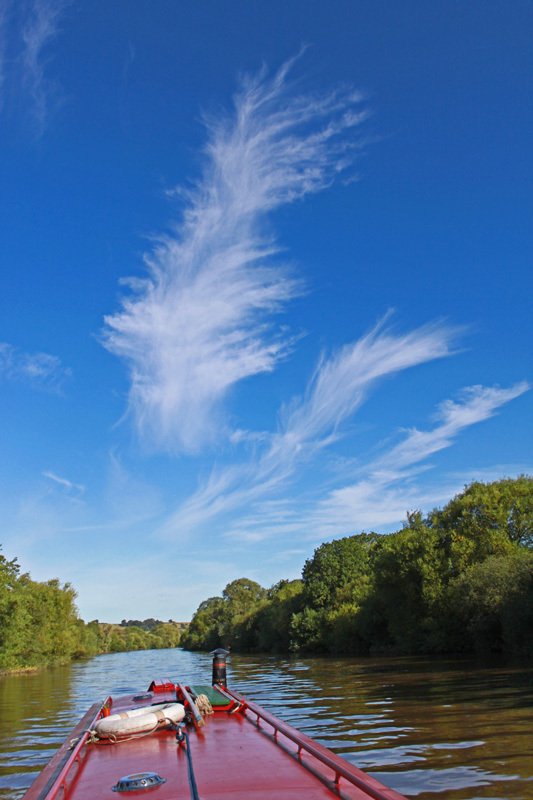 The influence of the ebbing tide weakened as we progressed and by the time we passed the Avon confluence our land speed had risen to a dizzy 4.00mph - which is about as good as it ever gets on the Severn. The evening before we had been chewing the cud with Chris and Maralyn of nb Nebulae, who also happen to moor at Calf Heath. We had exchanged thoughts about the slim possibility of escaping Gloucester today and they had pretty much given up hope. As we left they were still fast asleep but apparently woke as we chugged into the lock and figured if we could make it so could they - and made a start an hour later. We had been comparing top speeds and worked out that they could make nearly 0.5 mph more than us - so I spent the afternoon keeping a weather eye over my shoulder for the bows of a grey narrowboat. 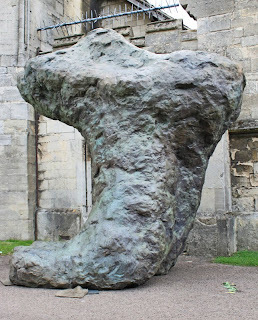 Sure enough, a couple of miles below Diglis lock I spied a blob of grey behind a small mountain of foam which slowly but relentlessly reeled me in. 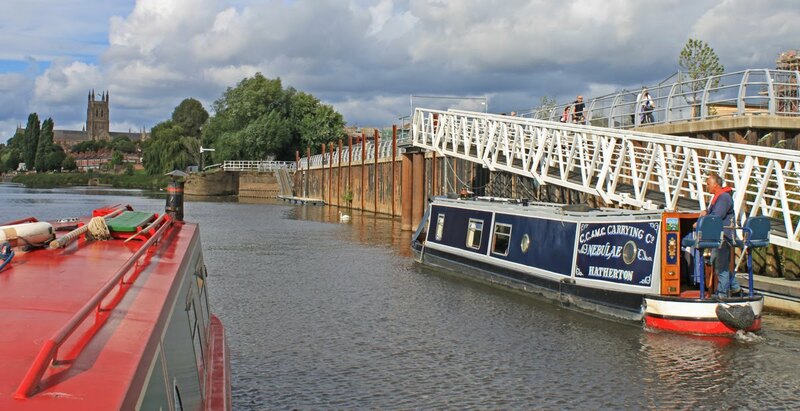 In the end three narrowboats approached Diglis Lock together, and warned by Chris on the VHF of our impending arrival, were directed to the large lock. The third boat had been on the Avon and became trapped for three days. 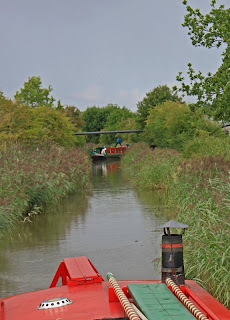 Their only way off was downstream and they has to shoot a number of very narrow bridges with a minimum of control. The helmsman still looked a bit grey about the gills and was very keen to return to the embrace of the canals. 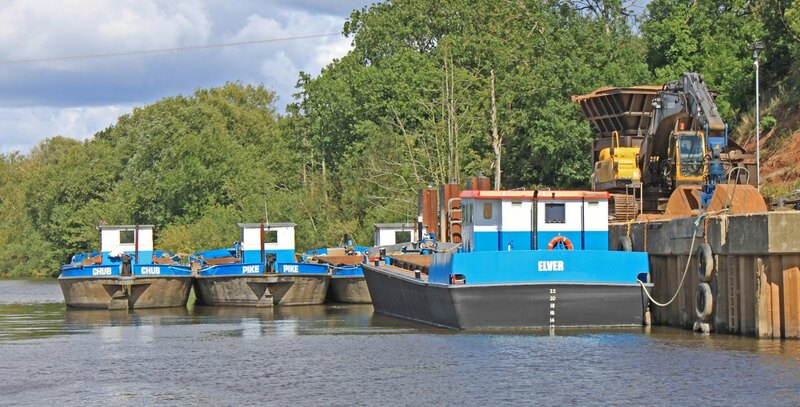 We both rose through the two barge locks into Diglis Basin, using the rubbish disposal point and taps before seeking out a mooring for the night. 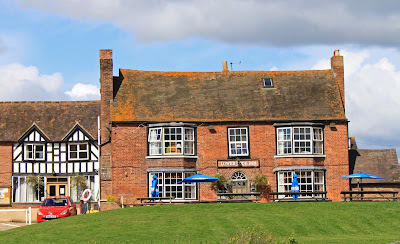 We moved back to the very end of the wharf near the basin itself, a spot we have used on a number of occasions whilst Nebulae went through the lock at the Commandery and moored on the official moorings. Our spot had the advantage of having the Anchor pub just round the corner and thus a ready supply of take out beer. 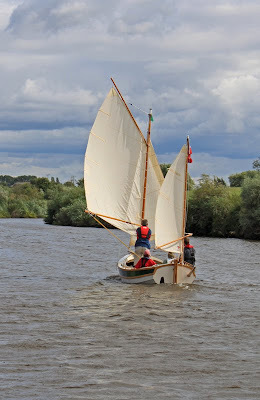 Sailing boat which was outpacing the narrowboats. 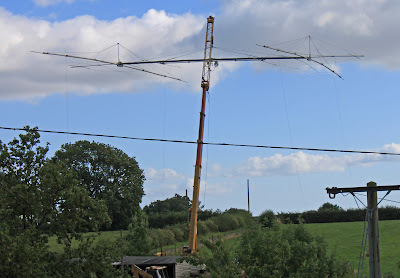 As it turned out, the weather was the best of the holiday so far - bright sun but tempered by a strong North Westerly breeze which dictated the use of a fleece out on the water. 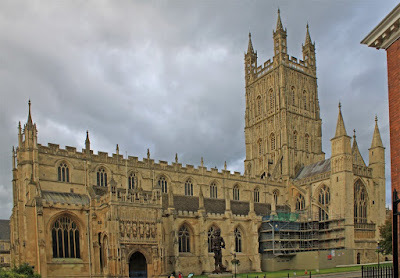 Our enforced stay in Gloucester left us with time on our hands and courtesy of the latest dongle technology we were able to see the celluloid options open to us at the nearby multiplex. It was decided that a 'boys' afternoon was in order so we quickly discarded all the soppy chick flicks. Then out with the cartoons because I have taken a solemn pledge never to watch one again (I make an exception for good CGT), and basically that just left Stallone's The Expendables. If it's non stop shoot em up action this is the film for you. The pace of the action ripples like Stallone's abs, how does he do it at his age? But whilst the flow is great its at the expense of a decent plotline. Essentially Stallone and mates are Ramboesque mercenaries selling their insane bravery to the highest bidder. They are hired to bring down a south american dictator and Stallone falls under the spell of his 'good guy' daughter. This tiny group then take on the might of the dictator's small army. That's about it really - just about every special effect is used to fill the plotline void and keep you fully engaged for an hour and a half. Even Jeff came out saying "there was no plot - but wow, its the best film I have ever seen!". If you like your gunfights loud and big, this is for you. If you want your grey matter stretched or your cultural horizons broadened, give it a miss. As for me? I got exactly what I paid for. An afternoon of mindless escapism with Stallone at his Rambo best. I bought this book a few months ago, inspired by it's detailed coverage of the Derbyshire canals, many of which I have walked over the last couple of years. I can't say it is exactly a page turner, but it is certainly stuffed full to the gills with historical information, all methodically collected, collated and presented. 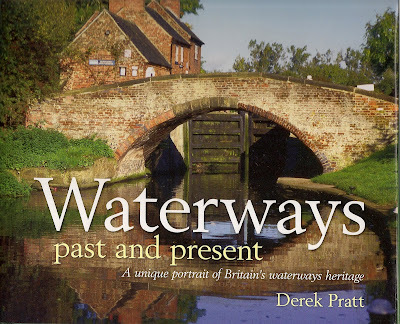 This book could so easily have been a series of six disconnected chapters about some of the more remote inland waterways but no. 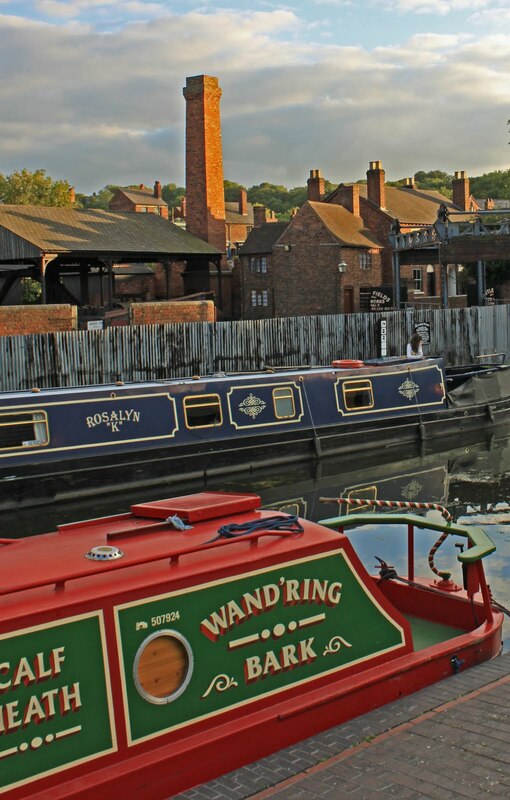 By a lucky stoke of fate Derbyshire also threw up three of the giants of canal construction in the shape of Brindley, Jessop and Outram, who between them form the backbone of an infant waterways industry. 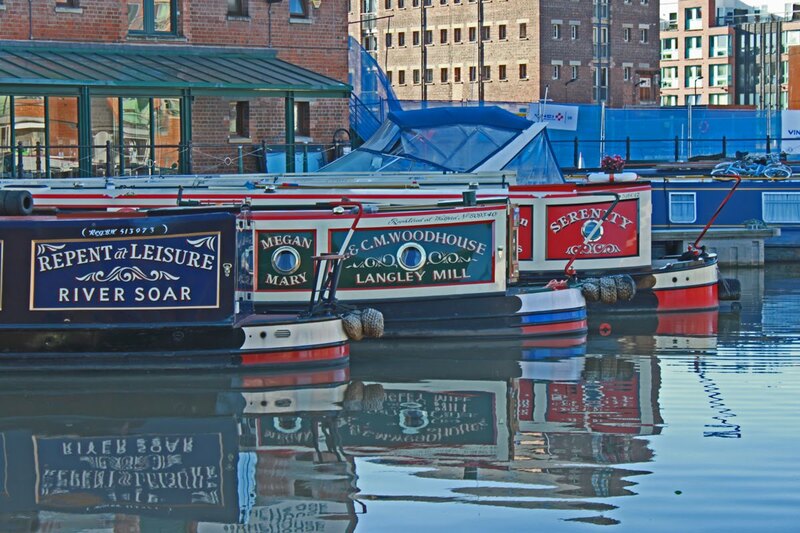 Garner uses these characters to give a wider picture of canal development, before diving into the detail if each canal's history. At times the attention to detail is almost too much, but then he hits a rich and absorbing seam of information which really grabbed me. 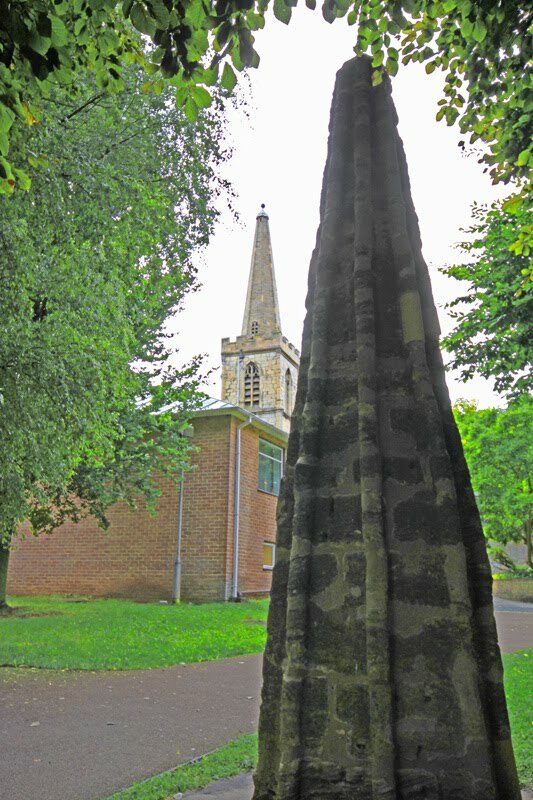 Take, for instance, the construction of the Norwood Tunnel on the summit of the Chesterfield. 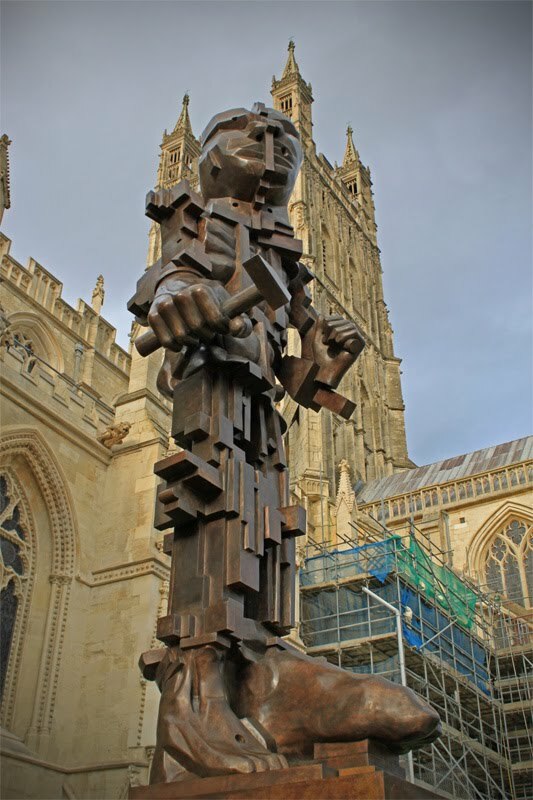 We know it was one of the longest at the time but did you realise that the root of its troubles lay in the mining which took place for minerals they found along the way? 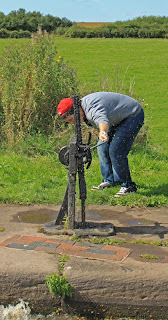 It seems that wherever you stuck a spade in Derbyshire you were as like as not to hit coal. They hit it in big qualities in the Norwood Tunnel and rapidly dug it out beside, below and above the tunnel. Guess what - the resulting subsidence collapsed the canal tunnel. 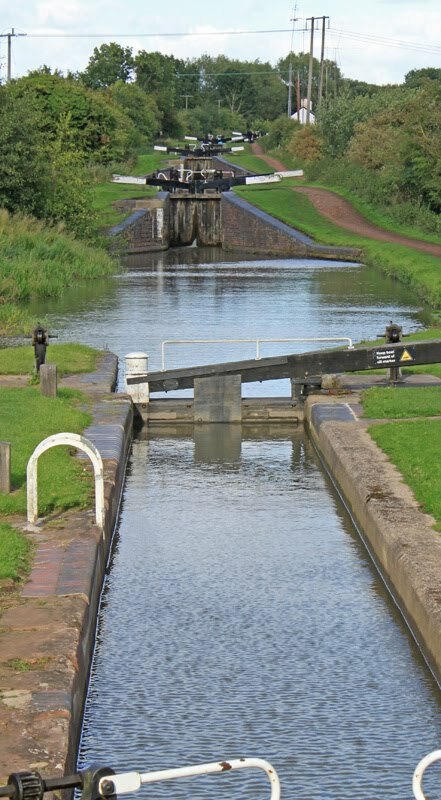 Canal engineers learned from this costly blunder and mining was strictly controlled in subsequent tunnels like the Butterly on the Cromford. It's snippits like this that make the book an enchanting lucky dip for occasional reading. 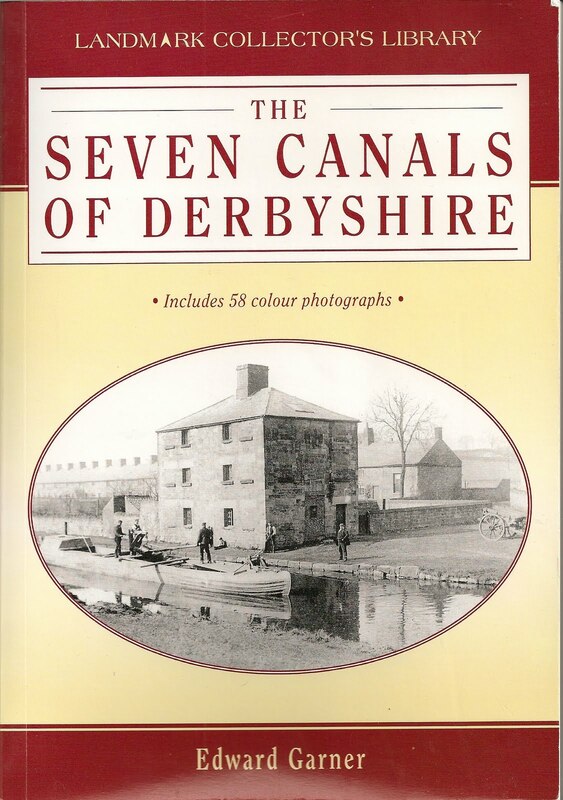 The book's not cheap at £16.95, but if you are interested in the history of the Derbyshire Canals then its probablyy the only one you will ever need to buy. 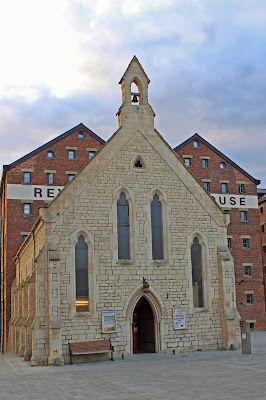 The delays in Gloucester provided ample opportunity for photographic expeditions in the dock and the wider city. Before we leave the area I thought it would be a good idea to post a selection of my favourites. 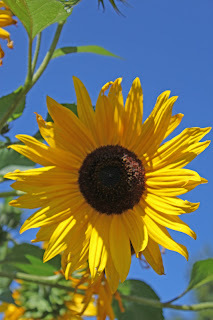 So, less words and more photos today. 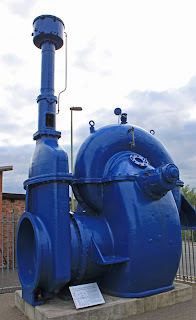 First a few images from round the docks including the old harbour pump which could lift an international swimming pool every two minutes - the new electric ones have twice the capacity. Also a new structure being erected in the marina. I don't know its name, but it bears a resemblance to the Skylon seen at the Great Exhibition. Big Pump and the new "skylon"
The Gatehouse and the new "mason" standing beside the main entrance. 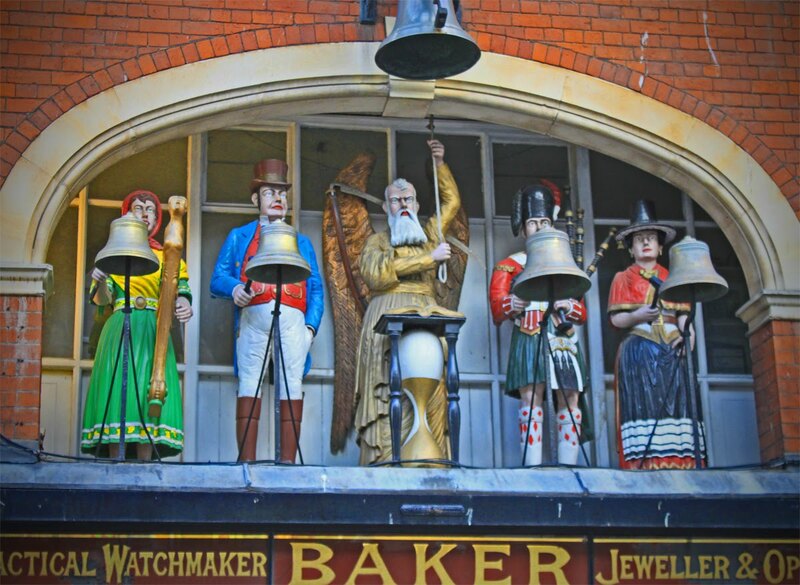 Chiming clock with figures that mark every quarter hour. 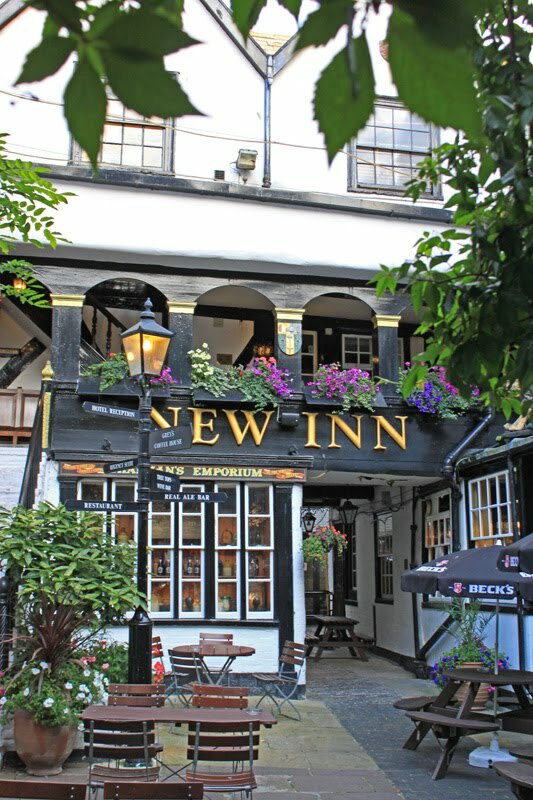 The New Inn where Shakespeare actually played.